Update as of Saturday, November 24: The William Floyd Colonials lost a heartbreaker to Freeport 20-19 at Hofstra University in a hard fought game that was neck and neck throughout. They left it all out on the field and can hold their heads up high. Although it wasn’t the outcome Colonial Nation had hoped for, they put together a great season and have so much to be proud of. Congratulations to the Colonials, Coach Paul Longo and the entire coaching staff on another terrific season that includes their 11th Suffolk County Championship! 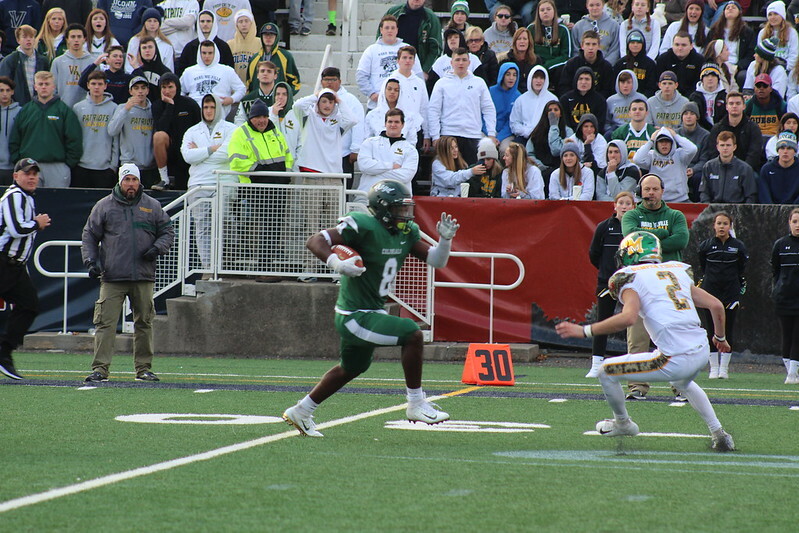 On Saturday, November 17, the William Floyd Colonials knocked off Ward Melville in a back-and-forth battle at Stony Brook University’s Kenneth P. LaValle Stadium by a final score of 34-17 to secure their 11th Suffolk Championship. This victory also clinched William Floyd’s spot in the 2018 Division I Long Island Championship game against Freeport (11-0) on Saturday, November 24 at 12 pm at Hofstra University. The Colonials faced adversity at the onset falling behind Ward Melville early 10-0. However, it’s difficult to keep Coach Paul Longo and the Colonials down, as they changed the momentum with one play – a 60-yard jet sweep by Ronale Thomas putting them on the board and only trailing by three, 10-7. After that initial score, the Colonials executed what may have been the two “plays of the game,” two consecutive onside kick conversions behind senior kicker Sebastian Paniccia and the special teams unit – the first of which helped set up William Floyd’s second score, a 34-yard touchdown pass from Mack Driver to Tyshawn Lopez, giving the Colonials a 14-10 halftime lead. Ward Melville took the lead back in the third quarter going up 17-14. The Colonials answered right back and marched down the field to grab the momentum back with a touchdown drive of their own. Nick Silva barreled his way through the defense to help set up Driver’s 1-yard touchdown run to put William Floyd back on top, this time for good. Following great stops on defense including an interception by senior lineman Keith Winfrey and a big fourth down stop, the Colonial offense once again moved down the field to put the finishing touches on their Suffolk Championship victory. Silva carried the load on offense, converting a 12-yard touchdown run, increasing the lead for William Floyd to 27-17. Driver would deliver the final score with his second touchdown run of the game late in the fourth quarter, pushing the lead to its eventual final score, 34-17. With this victory, the Colonials now own 11 Suffolk County Championships (2001, 2003, 2005, 2006, 2007, 2009, 2010, 2011, 2012, 2016 and 2018). They are now looking to add a sixth Long Island Championship to their trophy case with previous Long Island titles occurring in 2005, 2006, 2007, 2011 and 2012. For the Long Island Championship game, tickets are $10 at the gate charged by Section VIII (Nassau County). Tickets can be purchased in advance for $7 via the Go Fan website at this link or the Go Fan – High School app (please search for Section VIII). Please note there is a $1.35 convenience fee charged by Go Fan for use of its services. Congratulations to Coach Longo, the coaching staff and the student-athletes who have played their hearts out to get back to the LIC. One more win. Go Colonials! Photos from Saturday’s Suffolk County Championship victory are available in the album below!